يشكل فندق Blickinstal Barossa Valley Retreat بموقعه الممتاز في قلب تانوندا نقطة انطلاق ممتازة لاستكشاف وادى باروسا. يمكن من هنا للضيوف الاستمتاع بسهولة الوصول إلى كل ما تقدمه هذه المدينة النابضة بالحياة. يشكل هذا الفندق ملاذاَ مريحاً للاسترخاء ويمنح زواره فرصة للاستجمام والتجدد، وهو يقع على بعد خطوات من المعالم السياحية الكثيرة للمدينة كمثل: Menglers Hill Lookout, ست هاليت, باروسا فالي. يعمل Blickinstal Barossa Valley Retreat على ضمان إقامة مريحة لضيوفه من خلال خدماته الممتازة وحسن ضيافته. تتضمن الميزات الرئيسية في هذا الفندق: مرافق مخصصة لذوي الاحتياجات الخاصة, تسجيل وصول/خروج سريع, تخزين الأمتعة, واي فاي في المناطق العامة, صف السيارات. بالإضافة لهذا,تتضمن كل غرف الضيوف مجموعة واسعة من وسائل الراحة . بعض الغرف توفر حتى تلفزيون بشاشة مسطحة, حوض الاسترخاء, غرف لغير المدخنين, مكيف هواء, تدفئة لإرضاء أكثر الضيوف تطلباً. صممت خدمات الاستجمام في الفندق والتي تتضمن مسار جولف - ضمن 3 كم, سبا, حديقة لمساعدتك على الاسترخاء والراحة. إن كنت تتطلع إلى إقامة مريحة وهادئة في وادى باروسا، فستجد في Blickinstal Barossa Valley Retreat بيتك الثاني. a lovely quiet country retreat. Breakfast and afternoon tea is included which is lovely. Beautiful views of the Barossa Valley, overlooking vine yards. Jenny and Helen are lovely. room was comfortable. A pleasant place to stay. Staff excellent. Breakfast included and excellent. Afternoon tea also amazing. Jenny and Helen were the best. Thank you to both, you made it a pleasure to stay. I will be back again. comfortable clean room in large size. All facilities are in good working conditions. The host/hostess are very friendly. Excellent breakfast with view of vineyard. 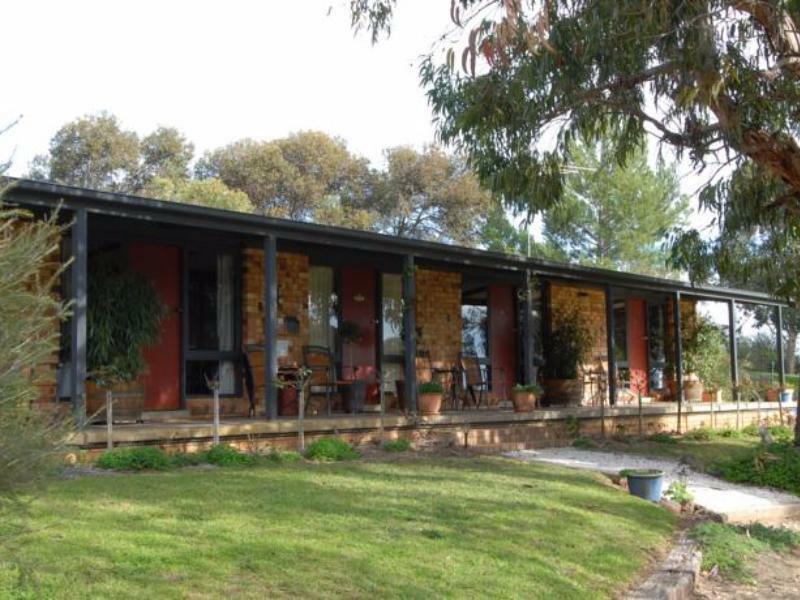 An ideal place for you to stay at the Barossa Valley. Afternoon tea is awesome !! We love the muffin & homemake strawberry jam ! Lovely stay with natural feel , room is big, like the bar table, have a cup of wine is wonderful. We definitely will come back again . Lovely quiet area with beautiful views but there is room for improvement. The damaged venetian blinds need replacing with something that blocks out the light & gives better privacy. Also the bed was very uncomfortable, sinking in the middle. The afternoon tea served was a nice touch & the freshly cooked breakfast was excellent. This is an absolute gem of a place for a romantic weekend away. The staff were excellent, especially Carrie who went above and beyond. The extras like the beautiful gourmet breakfast and delightful afternoon tea were wonderful surprises. Highly recommend!! Breakfast. Have stayed there often (6 times). That tells a story does it not. This is a great spot, I would highly recommend this resort. The staff are without question it's best asset breakfast was fantastic and nothing was too much trouble. A lot of hotels could learn a lot from how this property is managed. We stayed in a spa suite which was very comfortable and spotlessly clean. It is in a very peaceful location and there is a lot of bird life. Breakfast and afternoon tea was included i.we only had afternoon tea on arrival,but it was delicious . Breakfast was good, but exactly the same each morning, a bit of variety in the cooked offerings would have been appreciated. Overall we enjoyed our stay very much. Pleasant spot about 8 minute drive from Tanunda central. Very hospitable staff and nice home cooked breakfast. Very clean and good facilities. WiFi in the Lodge was a bit variable but tolerable for email exchanges. Would definitely stay again. A peaceful and beautiful place and in easy reach of all Barossa has to offer. Great views but highlights were the complimentary breakfast and tea. Arrived after midnight but no trouble locating our accommodation. All room facilities including WiFi were provided including a decanter of port. BBQ under cover was ideal for an evening meal bought at the local farmers market in Angaston and allowed an opportunity to meet other guests. Jenny the manageress gave us a great vineyard recommendation 'Tscharke' and Helen the chef made a superb brownie and banana cake for tea. I would highly recommend this accommodation. First time visitors to Barossa and we found Blickinstal to be located close to everything but tucked away enough to be a tranquil little escape. Rooms were clean and comfortable. The breakfasts and afternoon teas were delicious and always served with a smile. Lovely accommodation with a great ambience. Highly recommend. I'm not a huge bed and breakfast fan normally, due to a few experiences where there was a lot of forced polite conversation with other guests on one big long table at breakfast. However, Sue has converted me. Each party has their own table, and no forced mingling! Sue's breakfasts are absolutely delicious, and she serves some beautiful scones for afternoon tea. We stayed in a studio- it had everything we needed, even down to the fortified wine in a carafe for a nightcap. Would recommend to all our friends, and would stay here again. A truly beautiful place to stay with lovely views, just out of town. The rooms are just right, and Sue provides excellent breakfasts and afternoon tea. We had a really great experience and would certainly come back. Our weekend stay was one of the best weekend getaway we had fora long time. The location is quiet and the room was clean and relaxing. It was really a place to rest. There are plenty of things within 10mins driving time to do as well. Will definitely come back again!!!!!! The location was exquisite, relaxing and private. Sue was a wonderful host, couldn't do enough for us. The spa was fantastic and well enjoyed on several occasions. This was a short getaway for us, for my partner's birthday. We had an awesome time, walking the back roads of Tanunda, hiking up the steep hill to take in the panoramic views of the Barossa below. The accommodation was excellent and very clean as well as private. Sue was the perfect host, breakfast and afternoon tea was always delish. I would highly recommend this to my friends and family. Five starts, outstanding. Excellent stay. Nice and quiet and away from crowds. Clean and well maintained. Breakfasts were nice but a tad early for us most mornings. 9:00 am finish is too early. Well appointed with everything needed in the unit. Delicious home cooked breakfasts with a great view. Great size room/bathroom/kitchenette. Sue our host was so accomodating and lovely. We had a great weekend at Blickinstal...the type of place you could stay at and not bother exploring the surrounds. Of course we spent the days away and went out for dinner but breakfast and a rather civilised afternoon tea were not to be missed! The food was of an excellent standard and all cooked and baked by Sue and husband Mark. The room setup was great...the only problem was it was absolutely freezing while we were there and the heating struggled a little. Lots of little extras included...sweets and port in the room...a huge DVD library to choose from and of course all the home cooking...Sue even made GF muffins for us..which were great. Definitely a place we would recommend...and return to given the chance!